Rutherglen is possibly the only productive enclave of world class Durif wines anywhere on earth. It also yields a quality of Shiraz that's unique in the world of wine, by virtue of the region's quarantine of vines due to phyloxera. 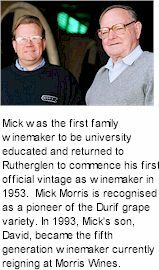 The Morris family have been making wine at Rutherglen since 1859. Within thirty years of establishment, their flourishing operations had made Morris the largest wine producer in the southern hemisphere. Introductions aside, Morris make an effervescent red wine of remarkable intensity, richness and class. Morris draw upon barrels of maturing stock from across several vintages to assemble a generously flavoured yet brilliantly integrated red wine, before initiating a secondary bottle fermentation and liqueur doseage. Historically Shiraz has been the variety used in Australian sparkling reds, but by adding components of the world renowned Rutherglen Durif, extra complexity and balance has been imparted to the flavour. A range of older vintages are balanced against younger wines, which are used to provide the fruit lift. After assembling all components, the wine is bottled with an addition of Rutherglen yeast and allowed twelve to eighteen months contact before disgorging and resealing under tirage. Medium to full depth crimson, a generous purple mousse. Rich fruit bouquets, Shiraz spice, yeast complexity and a hint of oak maturation. Rich and full flavoured palate, plum and blackberry and fruit jam flavours, chocolates and dusty carob over gentle, soft tannins. The powerful flavours linger long, complex and rich, a strawberry tang and licorice spice balance the excellent sweetness.